LATE NEWS - there is one 101 set - of which only 50 were ever made and generally cost approx Â£100 - which will go to the person who, across all the nominated justGiving pages below - donates the most by 23rd December 2013. "I already have a set but would like to support this"
"I'm just here because I know you and want to support you"
Incidentally I'm occasionally marking down the progress to this event with comments on twitter @azacru . I'm brand new at that so may go awry! Obviously your tweets and RTs on this would be much appreciated. You email me to say you are coming to the event (just a subject line is fine). If it's already Sunday 11.30am then just bring your email address, or other means of contact, along. to say you are coming to the event. If it's already Sunday 11.30am then just bring your email address, or other means of contact, along. 6 You come to the Didsbury Perk Cafe on Sunday 17th Nov 2013 between 12-5. 10 Otherwise I check and email you after 3, 6 and 12 weeks saying simply "just a reminder about Pacru 302" and after 12 weeks I won't contact you again (maximum of 3 emails) and will remove email address from my records. 1 I have 300 Pacru-302 sets (retail price has ranged between 19.99 and 35.00). Although Pacru, Azacru and Shacru will carry on, Pacru Ltd is closing down (not owing anyone any money apart from me) after 10 years. I have not been single-minded enough to run it well as a business (working full time elsewhere, having a family life and having other interests didn't really work with the energy and effort required) and the cost in time and money of publicity and promotion to sell the remaining stock commercially does not make sense. Some boxes/rules were for the German market - but I have spare copies of the English rules for these (and the rules are also available on this site as pdfs for many different languages). Let me know in your email if a German box is not OK for you. 2 The games have been well received and have sold from the USA to Germany to Japan. 3 I want these games to go to people who will enjoy them, regardless of ability to pay. 4 I want the money to go to good causes, and I've picked 5 very different ones you can give to, so that there is likely to be at least one that anyone will be happy to give to. 5 You email me to say you are coming to the event, or someone is coming on your behalf, and what name you will use when donating via justgiving website, and this is taken as agreement to my emailing you reminders after the event up to a maximum of 3 times (see point 10). If it's already Sunday 11.30am then just bring your email address, or other means of contact, along. 6 You come to the Didsbury Perk Cafe ,88 School Lane, Didsbury, M20 6GH Manchester on Sunday 17th Nov 2013 between 12-5. 7 You pick up the game set - we tick you on the list made from those who have emailed. You can go straight away (so could take two minutes in-and-out) or you can get a good explanation of rules from a player or you can hang around and play if you want (which is a great way of learning how to play any game). 9 If I've seen a donation from you on the page - Thank You! - I email you to say thank you and that's the end of it and I don't contact you again. 10 Otherwise I check and email you after 3, 6 and 12 weeks saying simply "just a reminder about Pacru 302" (as both title of message and content) and after 12 weeks I won't contact you again. I'll remove any email addresses and contact details at that point, unless you've asked to the contrary. How do I get to the Didsbury Perk? The address is 88 School Lane, Didsbury, M20 6GH Manchester. If you put M206GH into North West Journey Planner you should find metro (Didsbury Village metrolink is less than 10 minutes from the cafe), bus and train services. Have a look at JustGiving's own explanation of how to do this. I can't make the event and nor can anyone I know - is there anyway I can still participate? I'm nowhere near Manchester - can I join in? The postal cost is Â£5.60 (small packet over 1kg, 2nd class, no tracking). So in this case you would have to pay that cost to me via my personal paypal ( ). I'll then post any games asked for in this way on the following saturday morning after the request. I'm very happy to consider this - it would have to be at a weekend from now till the end of January 2014 - and it could only be in Manchester, Birmingham, Reading or London. Let me know what dates you can make. If Birmingham, Reading or London then it would be useful to have your ideas for a possible venue! I want to have/give the game set for Christmas. So I won't know what's it worth until after 25th December. Just let me know this when you email or pick the game up. That way I'll start your reminder emails from 3 weeks after Christmas. Â£2 - that's the minimum you can give on the justgiving website. If you think the game is worth Â£20 but all you can afford is Â£2 that's fair enough - it would be nice to hear what you think of the game! If you think the game is only worth Â£2 then I guess you are not going to be playing it in the future so please pass it on to someone who might like it (and they could always donate in your place if you let them know) or otherwise give it to your local charity shop. Can I donate more than I think the game is worth? Of course you can! You can just do it in one sum, or separate out what you think it is worth, and what you are giving because you like the idea or you feel like donating more to that charity. Can't you give a suggested figure? I think "what would you be happy to have paid for this?" is a good way of deciding. The game has been sold generally for somewhere between Â£20 and Â£35 pounds. This reflected the normal way of pricing a game based on its production costs (for a relatively small production run). If we had had many more manufactured then maybe that would price would have been down to Â£15. I can't afford much - won't my donation look small besides other people's? You can donate annonymously on justgiving (see the link under the question "how do I donate?") and you can just let me know by email that you've made the donation (which stops me emailing you a reminder). Anything contributed is good and I'm glad if you've got a game you might not be able to afford normally. Not if I and the small base of keen fans can help it. I will be working on identifying a suitable publisher for a new set on which to play the games, and also the possibilities for playing on smartphones etc. There have been Pacru championships for the last 10 years, Azacru and Shacru for over 5 years each. Is this a con to get free publicity and you are keeping back a load of stock? No. There are approx 360 Pacru 302 sets left. I'm going to keep 30 or so which will be useful in the process of looking for a new publisher, or for selling to some enthusiastic person from somewhere in the world who stumbles on Pacru and gets in touch (as happens very occasionally). Any of the rest of the stock that does not get picked up via this or other come-and-get-it events before the end of January 2014 will be taken by me and donated asa couple of sets per shop to charity shops around the north west (which sadly will probably raise much less for charity and mean less chance of ending up with someone who likes these kind of games). 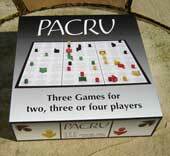 However there will be no manufacturer's boxes holding 6 Pacru 302 sets taking up costly storage space after January! I *do* hope it gives more publicity to the games - of course I do, but there is no immediate financial benefit from this and no conflict of interest. come-and-get-it: donate what you can later. I'm sure other people have done exactly the same thing many times before - but for me it was a combination of thoughts. I'd been interested in the ideas of paying-what-you-think-something-is-worth and paying-what-you-can-afford for a long time. It interests me that there are things I have, or services I've received, or events I'd been to - and you tend to pay a similar (not the same) price for the same type of thing. So I have music CDs for which I paid a similar price and some have been played 1-5 times (I try to give things a chance) but have not been played again ... whereas others have been played over 20 times, over 50 times or my favourites well over 100 times. So their value to me is very different but there isn't usually a mechanism where that benefits the people who made the CD ... unless they produce a different CD and I automatically buy that as something I'm likely to enjoy. There are some books which I wish I hadn't wasted my time on .. and others I wish I had time to read many times more (my favourite fiction being that of Russian 19th authors). Then Radiohead did their download thing where you can pay a variable price (I'm not a particular fan so didn't participate in that) which was a notable event. Paying-what-you-can-afford is perhaps one of the drivers of consumer participation in piracy. The argument, which has its merits but only partial validity in my view, is that certain goods are near-to-free a regards copying costs, and that isn't it better that a 100,000 people hear something with only 10,000 paying for it, rather than just 15,000 hearing something and them all paying for it. to say you want to do this then I'll email you after Jan 31st 2014 to say how the events(s) and their charity fundraising have gone. The target I've set myself for each charity for whom I'm trying to raise funds is Â£250. I'd suggest a donation of Â£2 if I reach a sum of Â£500 across all 5 justgiving pages, and if I actually reach a sum of Â£1250 across all 5 then you might consider a donation of Â£5. If you want to give me and my fundraising efforts some up front support by simply donating that Â£2 now that would be brilliant - I'd be on my way. By the way - do remember - you could always get a set through this event and then give it as a gift to someone else!